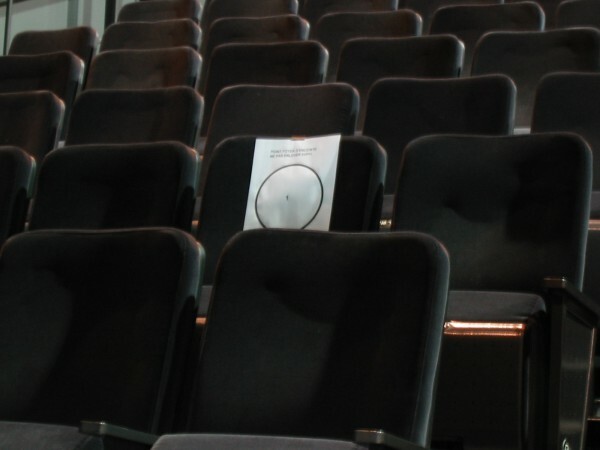 The following text is an excerpt from a paper presented at the 2012 conference Theatre Sound, held at the Université de Montréal by the Atelier de recherche sur l’intermédialité et les arts du spectacle (ARIAS) and the Centre de recherches intermédiales sur les arts, les lettres et les techniques (CRIALT). 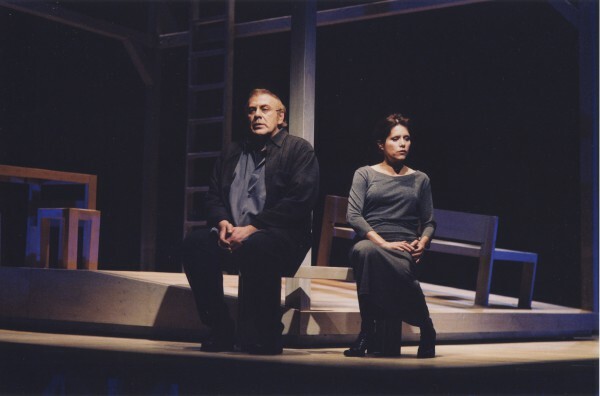 Through the theater production QUELQU’UN VA VENIR, directed by Denis Marleau, I will discuss the work that is entailed to successfully amplify voices using the vocal amplification method for theater. This method is based on a long tradition of research, many of which was developed in England. 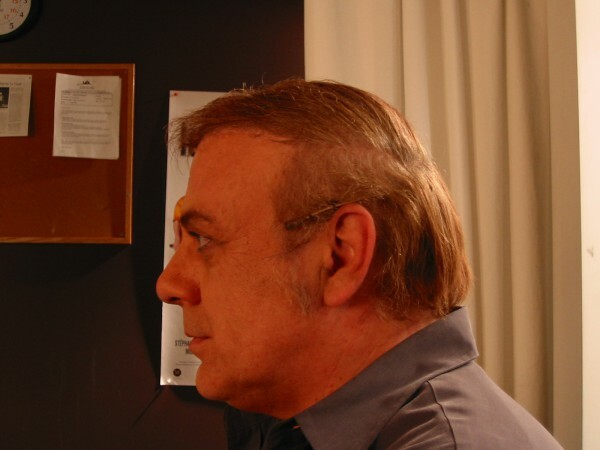 In 1997, I received a professional development grant that allowed me to observe what was being done in musicals with the company Autograph Sound in London and with sound designer Tony Meola on Broadway. Upon my return, I adapted what I had learned and observed to the specific context of theatrical productions in Quebec. The voice has always been particularly important for me. I’ve explored my own during my theater studies and I regularly use it in my artistic sound performances. When creating a sound design for a play, I’ve always been obsessed with a desire to amplify the voice in such a way that it becomes closely connected to the actor’s body. Unacceptable to hear the actor’s voice projected loudly out of the speakers as we can see him far away on stage, resembling a small puppet disconnected from his most intimate and expressive instrument – his voice. Even if self-evident, it is important to note that the director’s complicity and participation are critical. Had Denis Marleau not been so preoccupied by the actors’ “niveau de jeu” (his desire to avoid declamation), had he not been so rigorous and highly perceptive, the voice amplification method would not have experienced such a development. He was in a position to give me the means to achieve our end and he did so, always, without no doubt or hesitation. 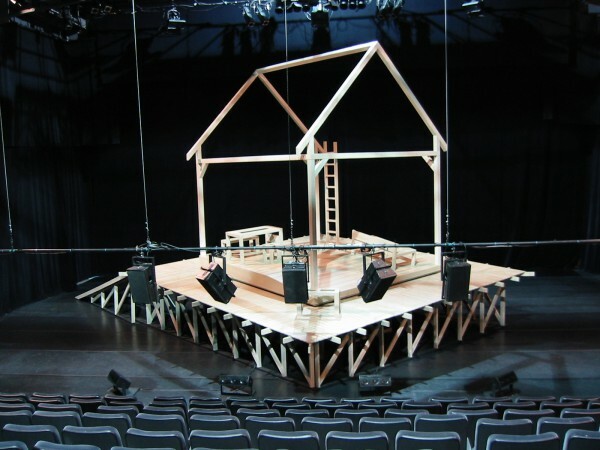 As we will see, those means were quite unusual and uncommon when compared to the sound design process typically followed when developing a theatre production in Quebec. 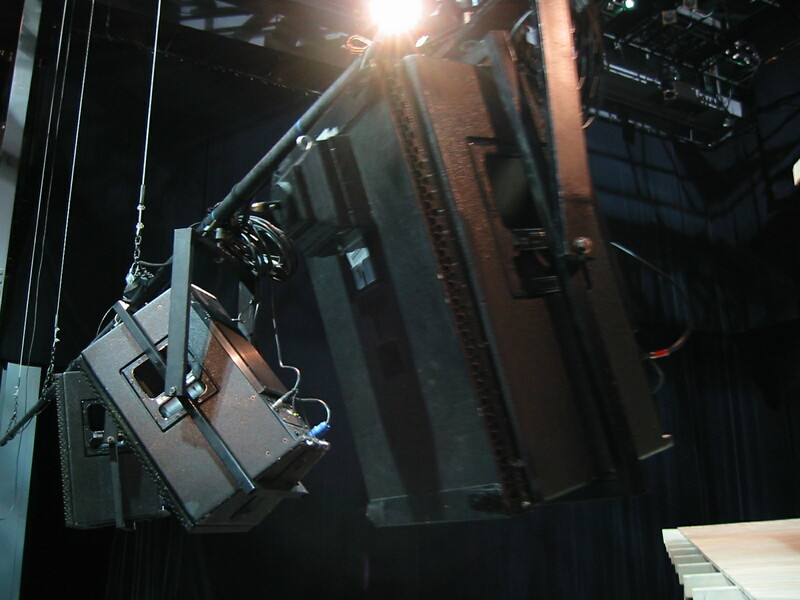 Solely for the voice amplification purposes, we had nine speakers positioned around the stage. 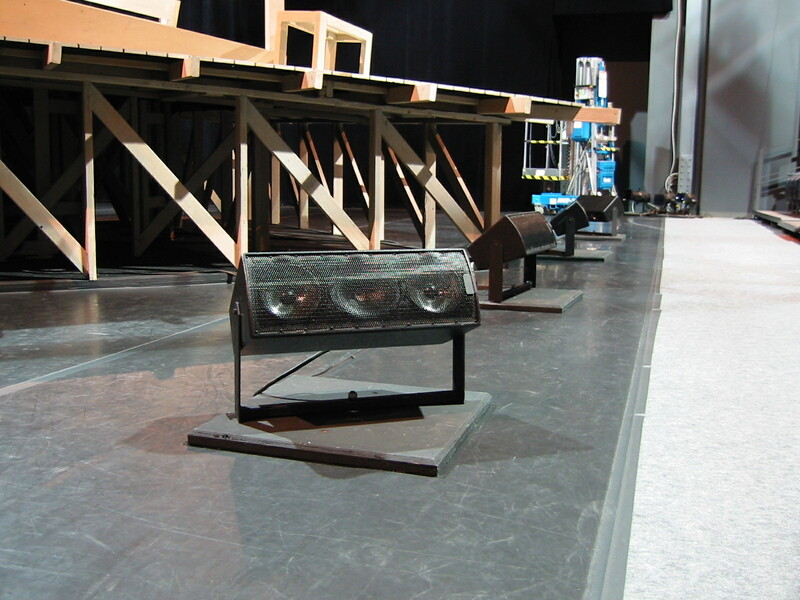 Five were installed in front over the set and four were at ground level, in front of the stage. Each speaker is carefully positioned so that it projects the amplified voices to a specific section of the audience. 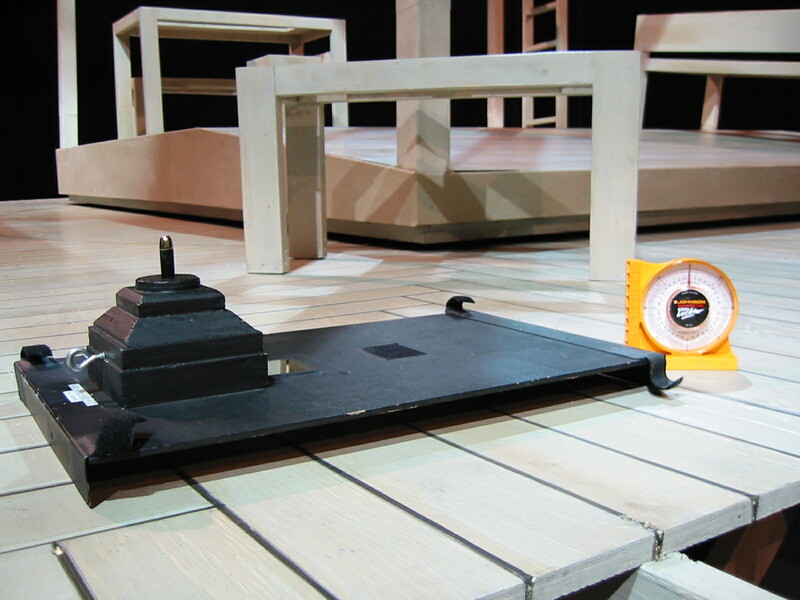 These are the tools we used to position precisely the speakers: the “laser board” to determine the horizontal (left to right) position and the inclinometer to determine the vertical (upward-downward) position. These photos date back to 2001. The tools used today are different, but the principles haven’t changed. The inclinometer is now digital and it usually incorporates a laser. 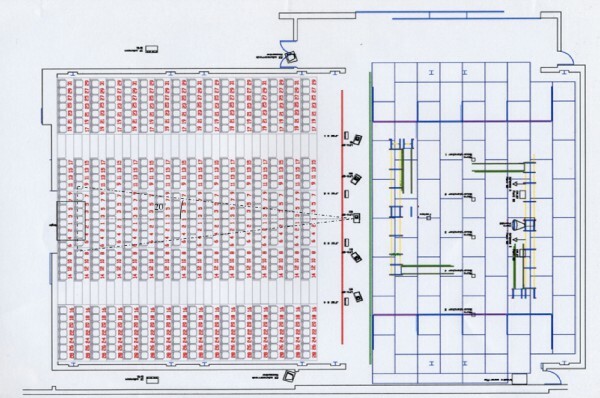 We start by doing a theoretical analysis to determine the best position of each speaker, using a scale ground plan of the theatre. 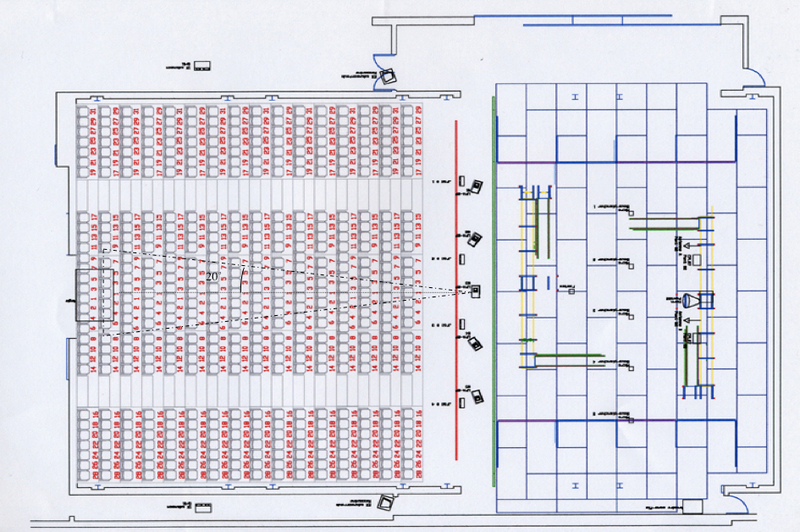 Our aim is for the sound to cover the entire audience as evenly as possible. 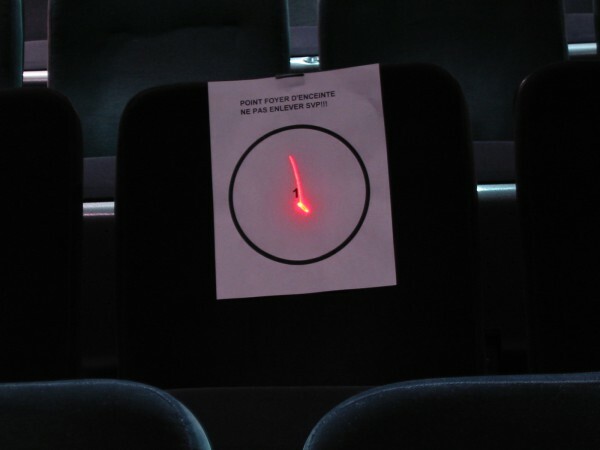 Each spectator must hear the voice clearly, wherever he sits. 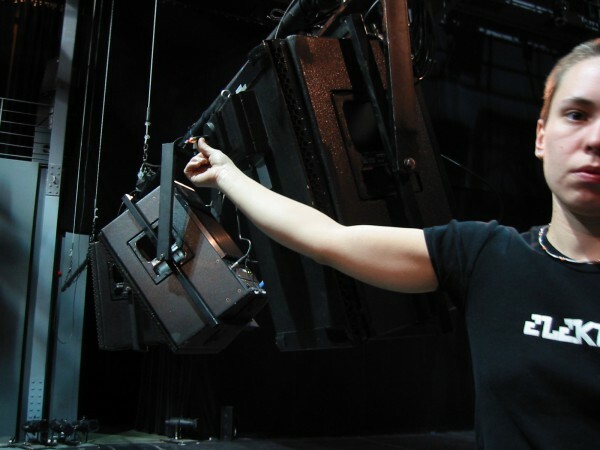 Once in the theatre, these theoretical positions are empirically verified and are fined-tuned during the “focus period” (to borrow the expression used in the process of lighting design). Seeing the speaker arrangement, all of them at the edge of the stage, you may be wondering how is it possible to avoid hearing the amplified voice before the acoustic voice. In other words, how is it possible to hear the actor’s amplified voice, yet still linked to his body? As explained by the French sound designer Daniel Deshays, important technical interventions must be made to ensure the « synchronicity » of the vocal perceptions (amplified and acoustic). Indeed, if nothing is done, the spectators who are closest to the speakers located at the edge of the stage will hear an actor’s amplified voice before his acoustic voice, since the latter is positioned behind the edge of the stage. Hence these two phenomena must be aligned, or synchronized, through the introduction of a delay in the speakers’ projection. By introducing a delay in the amplification we thus create the illusion that the voices perceived by the spectator, both amplified and acoustic, share the same source: the actor’s mouth. These delay adjustments require at least a two-hour working session in the theatre, in complete silence. I previously mentioned how unusual were the means necessary to achieve a good vocal amplification system. 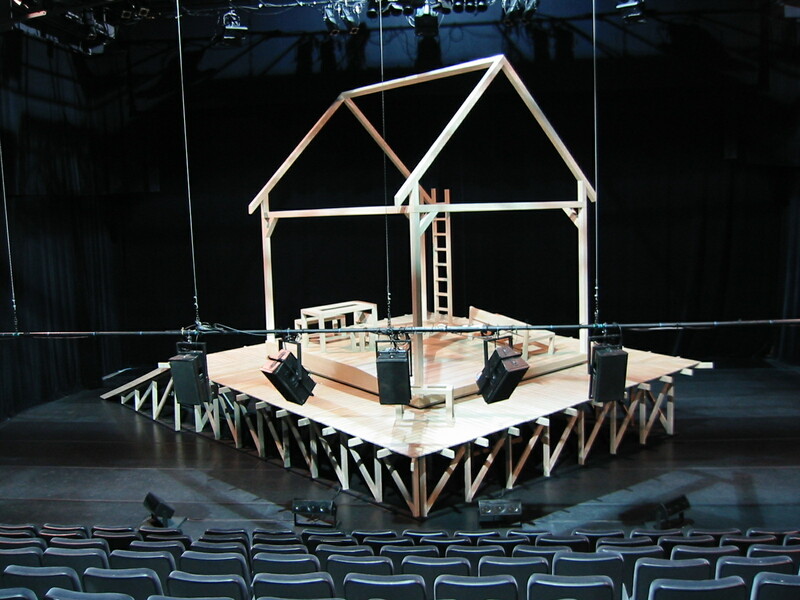 In a typical theater production, the time devoted to sound is restricted to the lunch breaks. Sound people don’t eat lunch (!) With Denis Marleau and his company, we usually plan a four-hour work session for the speaker positioning and the delay adjustments – on top of the lunch breaks, and on top of the adjustment of the speakers used to playback the music. Lastly, here are some photographs that demonstrate possible microphone positions used in the vocal amplification method for theatre. 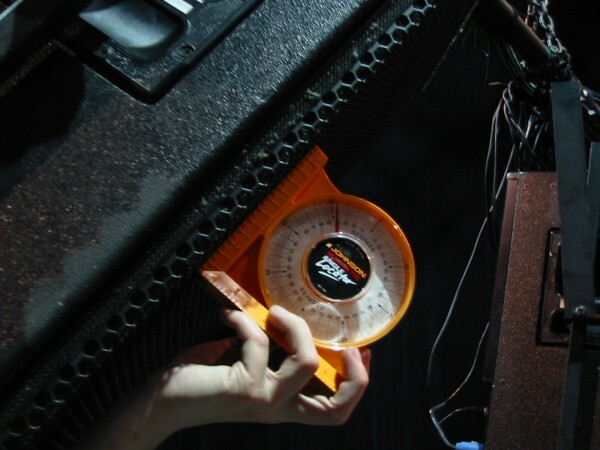 The design of the rig of the microphones is crucial to the success of vocal amplification. The microphone must be positioned exactly the same way show after show. The actors themselves usually do this task. 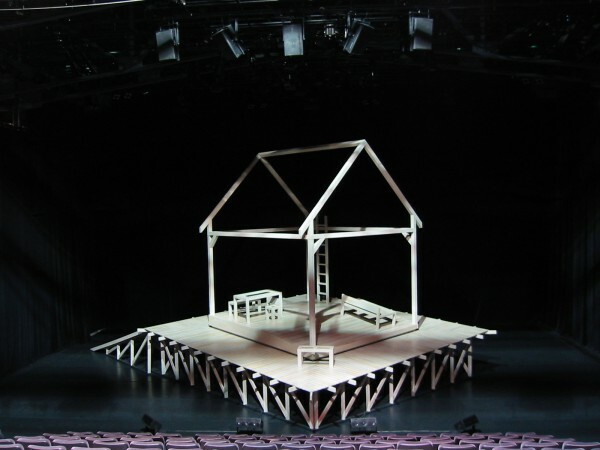 The system should thus be simple to put on and must be stable, whatever stunt, costume change, or choreography to be accomplished by the actor during the play. I have great admiration for Claude Cyr, head of the sound department at Théâtre Denise-Pelletier in Montreal. Claude is very inventive in this area. He designed the systems displayed in the following photographs. 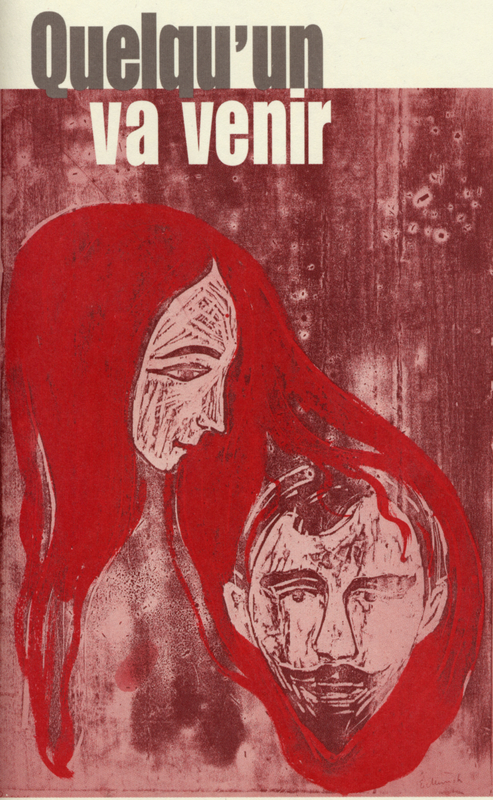 Edvard Munch: Tête d’homme dans les cheveux d’une femme, 1896. Wood engraving. Musée Munch, Oslo. © Musée Munch Groupe Munch-Ellingsen / BONO 2002. Photo: © Musée Munch (Anderson / de Jong).